Ankle ligament injuries are common amongst athletes. 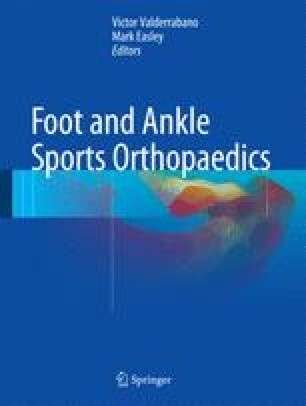 Low ankle sprains typically involve the anterior talofibular ligament and the calcaneofibular ligament while high ankle sprains involve the syndesmosis. These injuries present with focal tenderness, swelling over the involved ligaments, and pain with weight bearing. Specialized physical exam maneuvers and radiographic imaging can aid in the diagnosis of these injuries. Non-operative management includes immobilization followed by stretching, proprioception training and peroneal strengthening. Furthermore, ankle braces and proprioception training prevent repeat injury. Surgical management includes multiple procedures ranging from ankle arthroscopy to anatomic reconstruction.